Click here to download the above image as a powerpoint slide with an active link to share with your students and friends! Friends, as you may or may not be aware, the Florida Legislature recently designated September as 'American Founders' Month'. While covering material related to Founders' Month is, at this point, encouraged rather than required (though Freedom Week is still something of a mandate later this month), we will be providing you with some 'quick-hit resources' that can serve as either a warm up for your class or as a jumping off point for a deeper exploration. Throughout the month, we will be sharing images/slides featuring a person or group from the Founding Era. Currently, we are planning 2 or 3 a week, on a staggered schedule. 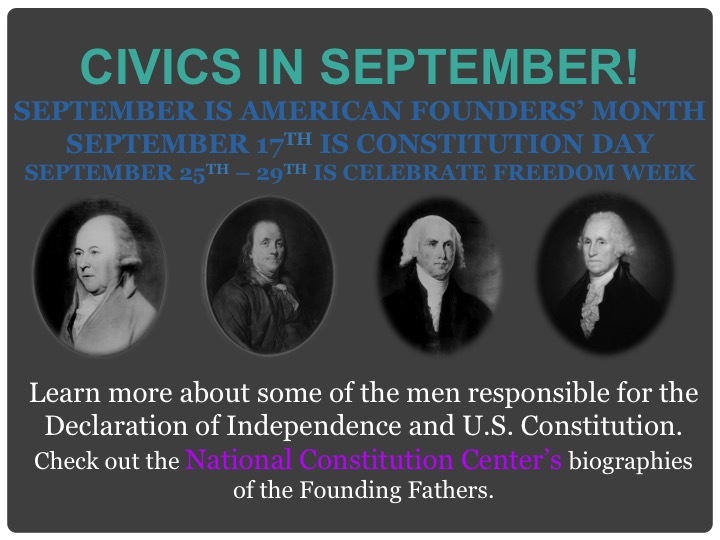 And for September 1st, we are happy to introduce the resources about the Founding Fathers available at the National Constitution Center!